This post is part of my year long experiment in charcuterie, inspired by #Charcutepalooza and my friends over at Mrs. Wheelbarrow and The Yummy Mummy. Thanks for the inspiration! Salt- is there nothing that you can’t do? Last month we learned that if you take some salt and rub it on a piece of pig jowl, you get a “super-bacon” type product called guanciale. This month we take that salt, mix it with water and spices, then soak some meat in it for a few days for a different kind of transformation. It’s called brining, and it can make a pork chop juicier, a cucumber turn to a pickle, and -in the spirit of St. Patrick’s Day- a piece of brisket in to corned beef. I’m not Alton Brown, so I won’t go in to the science of the brine, but it basically boils down to this. As everyone knows from 10th grade chemistry, when you put cells in an environment that has a higher salt content than the cell itself, salt ions enter the cell by diffusion. This happens when you take a piece of meat and put it in salted water (or brine). The end result is that the muscle fibers of the meat begin to take in water through osmosis. I’m a firm believer in brining my pork chops before cooking. I started this practice when I began to buy natural pork from my CSA. Most pork that you buy in the supermarket is pumped full of saline and other chemicals to make it plump and juicy. When I started buying pork straight from the farm I noticed that the meat dried out quicker. Thus began my experiments with brine. The fun part of a brine is experimenting with different spices and flavors. One of the cool things about a brine is that as long as you have the right ratio of salt to water (20 parts water: 1 part salt), you can flavor it however you want. That flavor is then imparted (through osmosis) in to the meat. I’ve done sugar brines, honey brines, spicy brines, and a bunch of other permutations that my rogue mad culinary scientist brain has concocted. Some came out great, some not so much. Since I was going to be experimenting with a brine this month, and since this is the month of St. Patrick’s Day, I HAD to try to make my own corned beef. Once again, I followed my bible, Charcuterie: The Craft of Salting, Smoking, and Curing . Mrs. Notafoodie procured a nice piece of beef brisket, and since I was out of town the days leading up to the “wearin’ o’ the green”, she began the brining process. It’s really simple. You take your brine (water, salt and pickling spices), and soak the brisket for 5 days, making sure it’s completely covered the whole time. Since our family is also Italian, we used large cans of stewed tomatoes in a Ziplock to weigh down the beef. On the 17th, around 4 hours before dinnertime, I took the brisket out of the brine and gave it a good rinse under cold water. I got a pot big enough to hold the Flintstone sized hunk o’ beef and filled it with water. 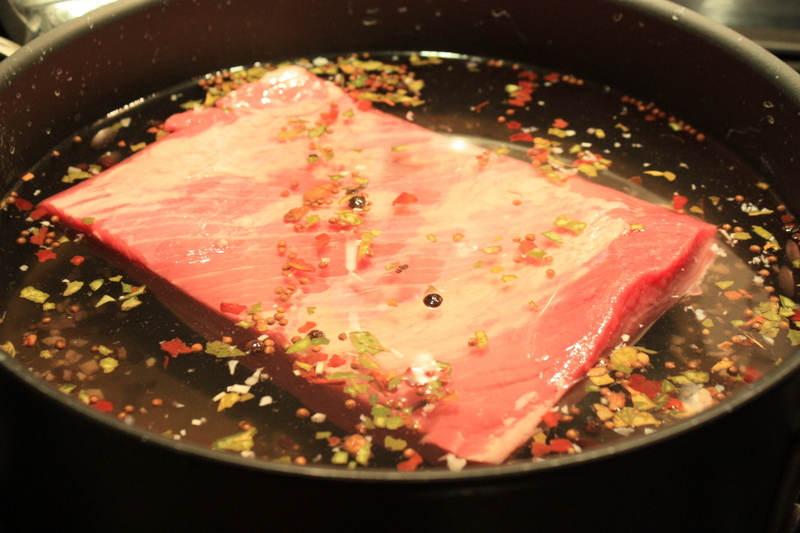 I sprinkled in some more pickling spices and I put the beef in the pot. I put the top on and let it simmer for a almost 4 hours while I drank Guinness and Jamesons and embraced the 12.5% of me that is Irish. Around 45 minutes before dinner, I quartered a cabbage, peeled a couple of potatoes, cut up a few carrots and (mostly to clear out my fridge from winter root veggies) I cut up a rutabaga. I dumped them all in the pot, and went back to drinking. The corned beef was phenomenal. It was delicate and had a slightly sweeter flavor than I was used to from the store bought variety. AND IT WAS SO EASY!!!! Just like with my guanciale experiment, I found out that all you really needed was a bit of planning ahead. Really, the most time consuming part was cooking the brisket, but you’d have to do that whether you made it yourself or bought it pre-corned from the supermarket. This is another one of those meals, that, as long as we have the time, Mrs. Notafoodie and I will repeat. 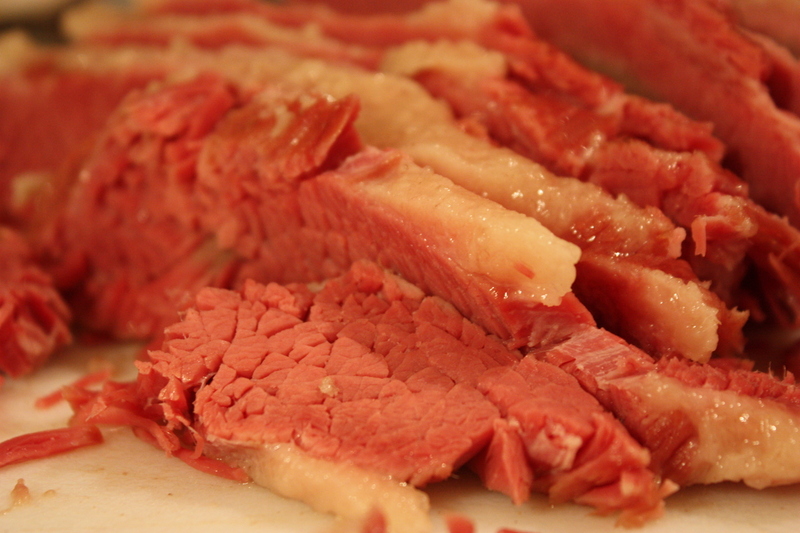 I don’t see myself buying pre-brined corned beef again. Bonus: Corned beef hash for breakfast. Nothing beats a good plate of hash with a perfectly cooked fried egg on top. I don’t know the science behind it, but like pizza and bloody marys, corned beef is a taste that is made for the morning. 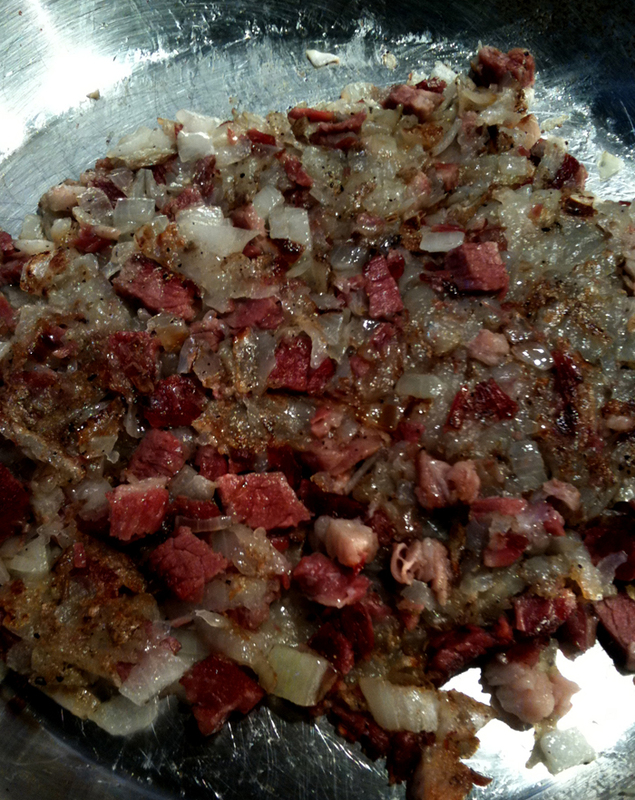 The best hash outside of Amsterdam- Onions, shredded potatoes, and corned beef fried in butter until golden brown.